I screamed like the big girly city chick that I am and high tailed inside. My heart beating a million miles a minute. Any one would have thought I broke a nail or *gasp* scuffed a shoe! I downed my double skinny mocha to build up enough courage to go outside and take a photo for my lovely internets. See how much I love you all? I risk my personal safety to have photographic evidence of my trauma so you will see how desperately frightening it is to live in a country town. I have peeked out the window and it is still sitting there. It’s huge claws ready to rip out my heart or at least give me a scratch worthy of a Simpsons bandaid (cause it has to actually break the skin to be allowed one of the hallowed Simpsons bandaids in this household). Perhaps word has got out to the monsters of the world that Casa Magnetobold has a new family member. Perhaps they are laying in wait to over power me and get to the bunny. OH.MY.GOD! What if Too sees it and wants to *gulp* keep it as a pet! ooop sorry didn’t mean to laugh at you out loud. I don’t mind the harmless looking tiny ones, but that sucker looks like he’s got TEETH! Run for the hills! Half an hour later it shook itself off and meandered away. Without even a backward glance. I would so want it as a pet. Can you send it to Michigan? Wow! My kids would think that was fantastic. Do you have to call the humane society for something like that? Do they live there normally? Very cool! We have alot of his relos here, if he needs a friend :)I can post them down your way, if you like. LOL, you gave me a good chuckle this morning. Thanks. What the hell is that thing??? I would have freaked too. I live in the desert and we have nothing that icky looking crawling around in our backyard! Run, run for your life. It may EAT your shoes…. Snort. I am having coffee for lunch. Maybe I have had to much caffeine. 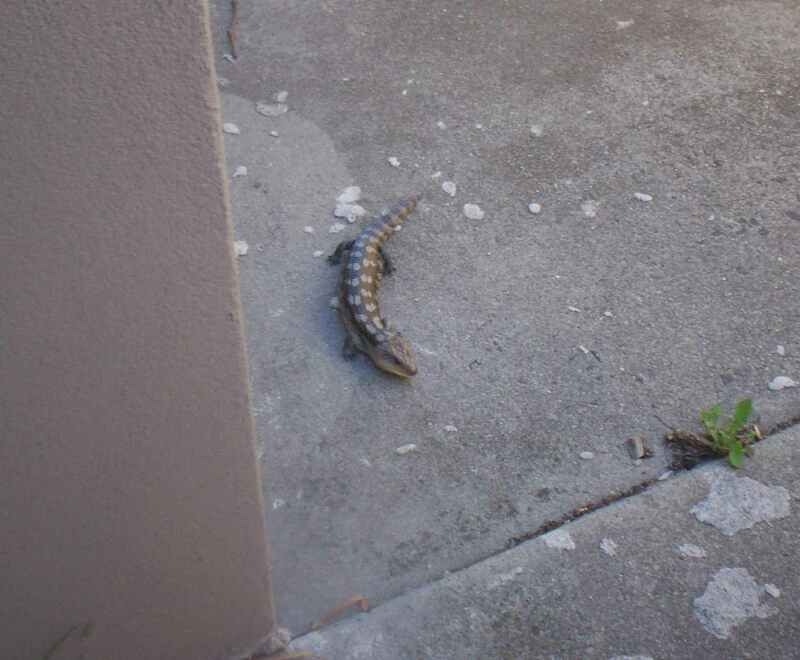 Hi, as a breeder of eastern blue tongue lizards I can tell you that if you leave it alone it will wander off by itself. In these times of drought they are coming closer to houses looking for water. It won’t hurt you unless you threaten it (and I can’t imagine you going close enough for that). Best wishes Kelley. Oh, dear LORD! What is that?! And hey, kudos on the new excuse for avoiding laundry… I might just try it! That looks like a mini-crocodile! How scary! OMG!!! I wished I had my camera the other day, because we have one living in our bushes. You know if you have blue-tongues, you don’t have snakes? I much prefer the blue-tongues over the snakes anyday. We had a shingle-back outside our window a while back – living under the barbecue cover. DH and D10 went snail hunting for him but he wander away at the first opportunity. Have I told you DH wants to get DS10 a bearded dragon for a pet? DS wants a bluey. Oh he/she is gorgeous. I love blue tongues. They are great to have around as they eat all the bugs that eat your plants. Very green and very cheap bug control. I had one hiding under my washing machine once LOL. And one fell in our pool years ago while running away from the magpies. Obviously it didn’t look where it was going. Its ok though, I got it out alive !!!!! Its OK, go and have another coffee and by then it probably will have gone and you can get the washing in peace. WOW… Where can I get one of those mum!!! Bettina: Don’t smootch me you biatch! It is a Blue Tongue Lizard. Man eating apparently. Robin: Dunno where it has gone!!!!!!! Deeleea: Yeah you are right. Scary looking thing. Lucky we don’t have any stagnant ponds round here or it would have to fend for its freaking self! Tiffany: DO NOT SEND THEM HERE!!!!! FXSMom: Finally someone else who thinks it is the spawn of satan. Girl: WHAT!!! MY SHOES!!!!! Nonononononono! Beth: Yup. Texas is not the only place they make things big and scary. Michelle: I even made sure that I turned off the flash. In case it lunged at me. It has disappeared now. Kim: Na na nana na!!!!! Madmad: I will find any excuse! Katie: LMAO. Well not quite! Veronica: Serious? Cool. Cause I actually thought it was a snake at first. Angel: I feel for you babe. And you will have to clean up after it too! Desert Queen: That just gave me the shivers. Under your washing machine. Then I would never ever get any laundry done. Beebeejaybee: Your mad like the others! lol.. i’ve already ruined 2 keyboards this year. And my filing tray, which was full. They have found another 2 keyboards just for the future..
LMAO you scare me.. in a good way. *shudder* We have sleepy lizards around here. Horibubble, ugly looking things that hiss at you and open their mouths really wide if you accidentally get too close. *shudder* At least snakes mostly have the good sense to run (okay slither) away from the sound of footsteps. *shudder* *shudder* Think I might just stay inside for the next 4-5 months…. Next post: Why it pays to have a ‘thing going on’ with your boss.